Tatsächlich bin ich von dieser, nennen wir es Maltechnik, sehr angetan. Eske Rex’s „Drawing Machine“ funktioniert mit zwei Pendel die einen Stift bewegen, der an zwei Stangen befestigt ist, die wiederum mit einem Scharnier beweglich gehalten werden. Die Muster die hierdurch entstehen sind vielfältig und fast immer sehr geometrisch. 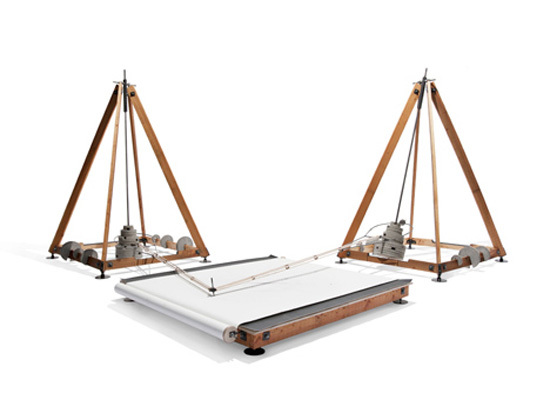 Drawingmachine is a construction involving two pendulums, each suspended from a tower construction and connected through “drawing arms” and moveable joints. A ballpoint pen resting on a drawing surface covered with paper is mounted at the point where the pendulums come together. The pendulums are set in motion by hand, and their movements are represented on the paper. The movements of the pendulums affect the entire room, and the experience engages the beholder’s body. While the rhythmic repetitions cause the beholder to pause, the drawing emerges on the paper. The technique of using weights and pendulums was invented in the Renaissance and applied in the so-called Harmonograph.